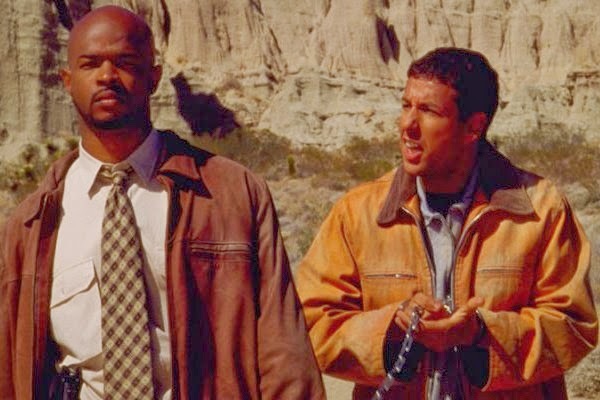 This past weekend I was lucky enough to catch the airing of the Damon Wayans / Adam Sandler vehicle, Bulletproof (1996). I say that because there's no other reason I, or any other human being, would ever watch this movie. When discussing either the legacy of Damon Wayans or Adam Sandler, it's a mystifying entry. The plot isn't really engaging, the jokes aren't really uproarious, and it's essentially a misfired attempt to slap two big comedians into a buddy action flick. As I watched it, though, more and more my thoughts turned to Sandler and his potential as an action star. A surefire recipe to be loved by no one. Damon Wayans in the early 90s made a nice block of awful films in the wake of blowing up big on In Living Color. These included Blankman (1994), Major Payne (1995), and Celtic Pride (1996). I actually dig Blankman, and Major Payne is probably Wayans' most famous film role, but none of these are especially great, immortal comedies. In regards to Bulletproof, though, the most relevant of his films is The Last Boy Scout (1991), which is probably the most outrageous of all the Shane Black action films of the era. Adam Sandler had a similar career at the time. He was known more for sketch comedy roles at the time on SNL, but had a string of tiny appearances in likewise high-profile but ultimately forgettable comedies like Shakes the Clown (1991), Coneheads (1993), Airheads (1994), and Mixed Nuts (1994) before his own signature film, Billy Madison (1995). The pairing of these two guys seemed like a no brainer. Bulletproof is so weird, though. It's constantly trying and failing to be like a Shane Black film. It's got the Black Cop / White Cop dynamic begun with Lethal Weapon (1987), even though in this case Adam Sandler, though forced into an unlikely partnership with Wayans, is a criminal rather than a cop. Even their names - Rock Keats (later revealed to actually be Jack Carter) and Archie Moses are the kind of ridiculous action trope names that are completely ridiculous. The whole film is pretty bad, there's a couple goofy gags, James Caan is in it for some reason, but over all it's just bland. I do want to see more of Adam Sandler brutally killing people. But we still got to see Adam Sandler the action star. We see Happy Gilmore shoot a guy in the eye then immediately drop an F-Bomb. It's kind of awesome. Sandler plays the same kind of weird dumbass character he always did in this era, but he's shooting people and fighting instead of being a plucky but angry sports star. It's a shame that we never got to see more of this. Think of Sandler in a parallel universe becoming another Bruce Willis, cracking frat boy jokes as he crushes skulls. It's this strange juxtaposition that only seems weird because of how awful Bulletproof was. Because of its failure on every possible level. It gained no positive critical reception, even from its director, Earnest Dickerson, who has since publicly derided the film. It was a box office failure. And finally, despite its high profile stars, interesting play with their personae, and awful composition, it's been completely forgotten rather than relegated to cult status. When considering this article, I thought also of something similar I wrote concerning the misunderstanding of The Cable Guy (1998) upon its release and its toying with Jim Carrey's public persona, which very nearly cost him his career, at least in comedy, until Bruce Almighty (2003). The thing with Bulletproof, though, is that it doesn't come at the expense of Sandler's persona. He's the same guy lost in another genre of film. With Wayans, it's less of a stretch with established roles in the superior but far goofier Last Boy Scout and even the similar crime elements of Blankman. I'm just continually fascinated that Bulletproof exists. At least it was the obvious inspiration for La Roux and Raheem DeVaughn songs. Maybe not. I'm not recommending watching Bulletproof, but I want you to do something like picture Adam Sandler with Andy Samberg in Looper (2012) instead of That's My Boy (2012) and you'll get the point of this collection of thoughts. Oscars 2014 - Live Results!